I’m just going to ask once. Please, back off. Everybody with the blogs and the nice new wool and the projects that are better than mine (because they are not mittens) …just back off. 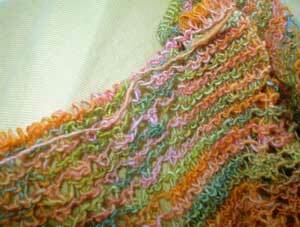 Clapotis is bugging me. I don’t care how many times you show me Clapotis, I’m not ripping this back and turning it into one until the mitten is knit. The fact that this yarn has somehow made it’s way from the upstairs UFO containment zone onto the top of the piano is completely unrelated to the level of my resolve. I was just looking at it, that’s all. Just so that you all understand…here are some strategies that are not going to work. I will remain unmoved even if you write poetry about it. I will not knit it even if you knit it in Toronto out of Fleece Artist. I will not knit it even if it is recommended to me by the Editor of Knitty. She, like Clapotis itself, is biased. I will not knit it even if you call it “The Clapper” , thus making it sound like it is even more fun and funky that it already did. (As well as rather vaguely like a venereal disease..) as well as knitting it in the yarn (Morehouse Merino Laceweight) that just happens to be on the top of the piano. Putting it in my favourite colours is just mean. Knitting it in my other favourite colours and then blogging about it in French to make it even more magnifique, and even going so far as to tell me that “C’est très plaisant” is tricky, charming and Not. Going. To. Work. I will not knit it, even if in the picture on your blog you look really, really great wearing it and I start thinking that I might look that good if I was wearing a Clapotis, especially since we both have curly hair and that makes is seem so possible. Finally, even if you write about it charmingly, and make it sound as though the inner peace and zen I so desperately seek this month will be found along the running, elegant dropped stitches of Clapotis, I will resist you. In fact, you should all just abandon the stinking idea that I can be corrupted at all. 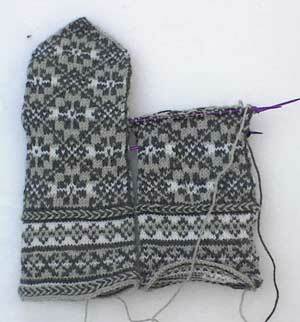 I am resolute in my intention to finish the mitten, even though it got pretty stinking old about a half a mitten ago. 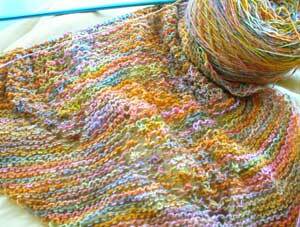 I’m not ripping back the shawl and starting Clapotis. 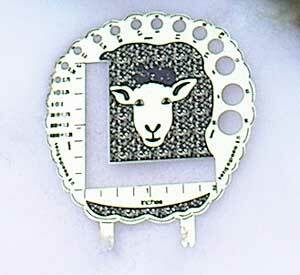 The needles just sort of ….fell out. I will remain faithful to the mitten. I have not yet run out of the grey…I don’t know how it’s possible, but I seem to be knitting without using any of it up. 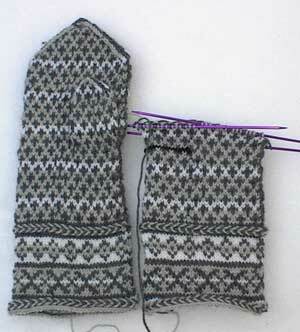 I’m starting to think that it’s a mitten miracle. You know…there’s only enough Kroy to last for ten rows but somehow it lasts for 70? I’ll be conducting a search for more, and continuing on the mitten as soon as blog consensus and approval is reached. Janet has a copy of Weekend Knitting that the very lucky Sue M. is going to be pouring over. Mary-Heather will be sending “For the Love of Knitting” to Lisa D. who I hope will let me know how it is, since it looks brilliant. 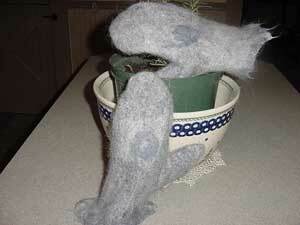 Kim made these beautiful felted mittens with an electric sander. 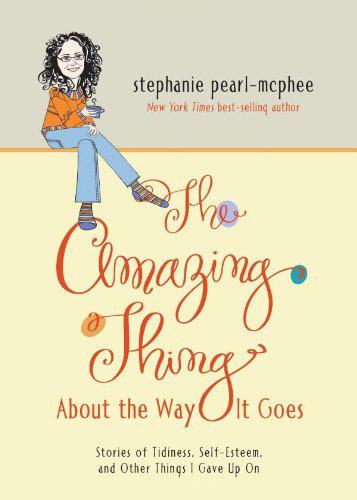 Go read about it, especially if you are Kristen W.
from Erin. It is worth noting that that Erin donated this, then won yesterday. This is proof that Karma is occasionally obvious.